Saint John of the Cross or San Juan de la Cruz lived from 24 June 1542 to 14 December 1591 and was born Juan de Yepes Alvarez. He was a major figure of the Counter-Reformation, a Spanish mystic and a Carmelite friar and priest. Born in Fontiveros, Old Castile in Spain. John learned the importance of self-sacrificing love from his parents. His father gave up wealth, status, and comfort when he married a weaver's daughter and was disowned by his noble family. After his father died, his mother kept the destitute family together as they wandered homeless in search of work. When the family finally found work, John still went hungry in the middle of the wealthiest city in Spain and, at fourteen, he took a job caring for hospital patients who suffered from incurable diseases and madness. It was out of this poverty and suffering, that John learned to search for beauty and happiness not in the world, but in God. John joined the Carmelite order and Saint Teresa of Avila asked him to help her reform movement. John supported her belief that the order should return to its life of prayer. Many Carmelites felt threatened by this reform, and some members of John's own order kidnapped him, keeping him locked in a cell six feet by ten feet and beating him three times a week. There was only one tiny window high up near the ceiling. Yet in that unbearable, desolate dark and tiny cell, his love and faith flourished and God brought John his greatest joys. After nine months, John escaped by unscrewing the lock on his door and creeping past the guard. Taking only the mystical poetry he had written in his cell, he climbed out a window using a rope ladder made of blankets. With no idea where he was, he followed a dog to civilization and hid from his pursuers in a convent infirmary where he read his poetry to the nuns. From then on his life was devoted to sharing and explaining his experience of God's love. His life of poverty and persecution could have produced cynicism. Instead it produced a compassionate mystic, who believed, "Where there is no love, put love -- and you will find love." John left us many books of practical advice on spiritual growth and prayer that are just as relevant today as they were then. These books include ‘The Ascent of Mount Carmel’, ‘Dark Night of the Soul’ and “A Spiritual Canticle of the Soul and the Bridegroom Christ’. Since joy comes only from God, John believed that someone who seeks happiness in the world is like "a famished person who opens his mouth to satisfy himself with air." He taught that only by breaking the rope of our desires could we ascend to God. Above all, he was concerned for those who suffered dryness or depression in their spiritual life and offered encouragement that God loved them and was leading them deeper into faith. 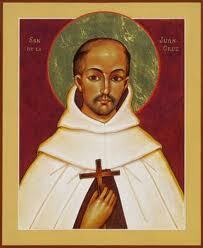 Saint John of the Cross, in the darkness of your worst moments, when you were alone and persecuted, you found God. Help me to have faith that God is there especially in the times when God seems absent and far away. Amen.